Several of our clients have come to us with existing sites that require maintenance. We did not design the site below, but we update it as required by the clients. 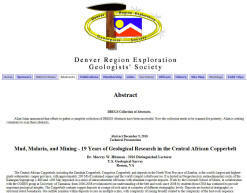 The Denver Region Exploratoration Geologists (DREGs) is run by volunteers and none of the members has time or expertise to maintain the Society's website.